Accolades. 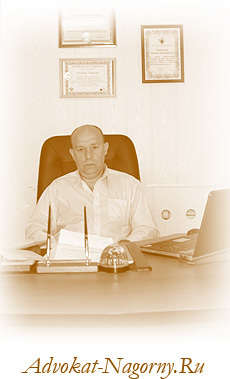 Evgeny A. Nagornyy, attorney at law. Evgeny Nagornyy, attorney at law. Profile. 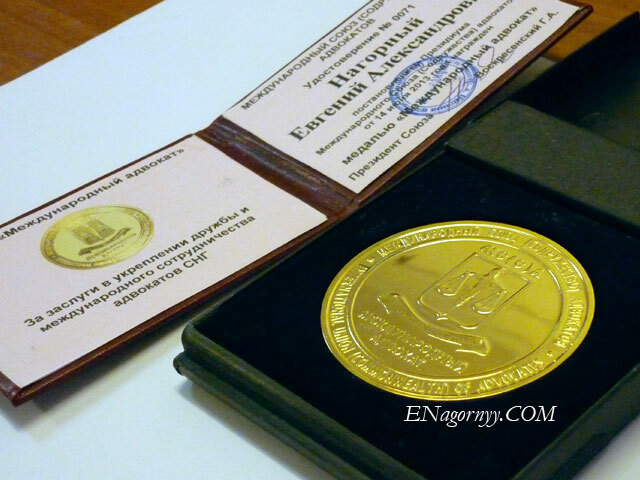 In 2013 he was awarded by the gold medal "The International Advocate" of the Executive Board of the International Union (Commonwelth) of Advocates and by a Memorable Symbol of Tver Bar Association. 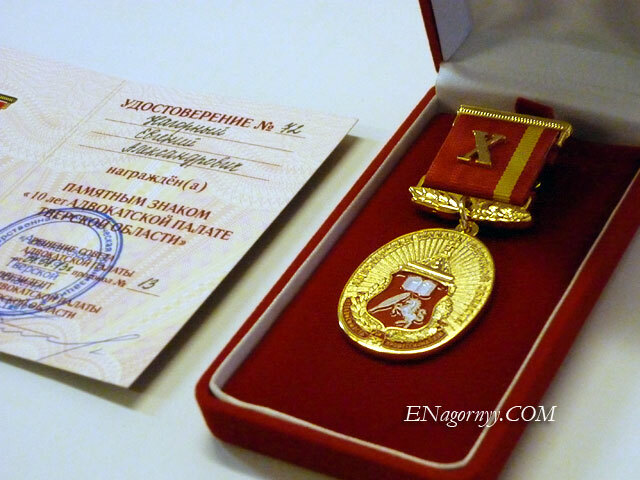 Evgeny Nagornyy was rewarded by the Grateful Letter of the Bar of Russian Federation (2008) and by the Honourable Diploma of the Legislative Council of Tver oblast (2011). Evgeny Nagornyy is the legal adviser to the largest donor-funded project on SME support in the Western New Independent States, which is operating throughout Ukraine and Moldova and promotes private enterprise development through a network of business centers, business associations and advisory services to the national government. 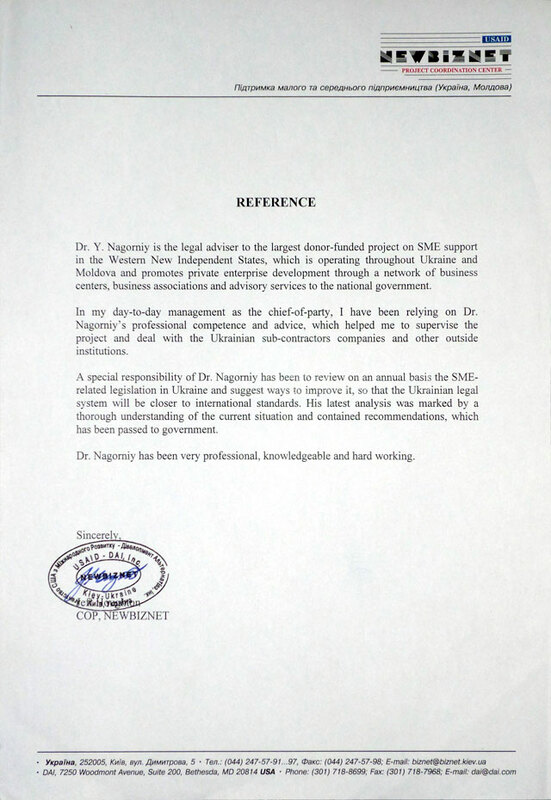 In my day-to-day management as the chief-of-party, I have been relying on Dr. Nagorny's professional competence and advice, which helped me to supervise the project and deal with the Ukrainian sub-contractors companies and other outside institutions. A special responsibility of Evgeny Nagornyy has been to review on an annual basis the SME-related legislation in Ukraine and suggest ways to improve it, so that the Ukrainian legal system will be closer to international standards. His latest analysis was marked by a thorough understanding of the current situation and contained recommendations, which has been passed to government. Evgeny Nagornyy has been very professional, knowledgeable and hard working. We have had the pleasurable experience of being professional colleagues with Yevgeniy while also enjoying his personal friendship. We treasure his time with us in his capacity as an IREX intern placed at our agency for four months, via the USAID Contemporary Issues Fellowship Program. Yevgeniy is a self-starter. He is creative, persistent in his work, productive, and cooperative with supervisory staff and office colleagues in general. His work products exemplify thoroughness, accuracy, academic integrity, promptness, and valued practicality. Yevgeniy's character is without blemish. His humor is quick, relevant, and never inappropriate. If given the opportunity to repeat the experience we would do so without hesitation or condition. Mr. Yevgeniy A Nagorny is the practise lawyer, who is engaged in research of the protection of business in Ukraine and Russia as well as legal conflictology. This research lets him to prepare the special academic course "The problems of business for students of Law Department of the International Science and Technology University. The mentioned course of Mr. Y. Nagorny contains a lot of practical cases that are used as a foundation of the theoretical aspects of the course. The course is very useful for students studied law. 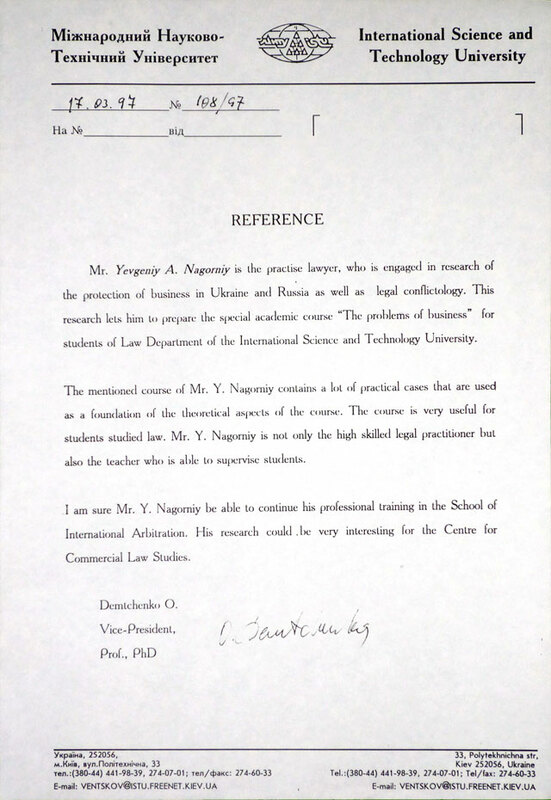 Mr. Y. Nagorny is not only the high skilled legal practitioner but also the teacher who is able to supervise students. I am sure Mr. Y. Nagorny be able to continue his professional training in the School of International Arbitration. His research could be very interesting for the Centre for Commercial Law Studies. International Science and Technology University. Evgeny Nagornyy has participated in the work of the international conferences and workshops as an invited participant and a presenter. The Workshop of the IBA, OECD, UNODC “Risks and Threats of Corruption and the Legal Profession” with support of Ministry of Justice of the Russian Federation, 17 April 2012, Moscow, - attends as a participant. The Workshop of the Tver State University “Problems of Supervisory Retrial”, 26 September 2010, Tver, - attends as a participant. Conference for the US Government Sponsored Academic Program Alumni “Cultural Studies in Contemporary Ukraine”, December 16, 2000, Kyiv, - attends as a presenter. Conference “Promoting Alternative Dispute Resolution in the Ukrainian Legal System” with support of the Eurasia Foundation and Kingdom of the Netherlands Embassy, 17-20 May, 2000, Kyiv, - attends as a presenter. 7th Annual International Conference on Conflict Resolution with support of HARMONY Institute for Psychotherapy and Counseling and Common Bond Institute, 7-12 May 1999, St. Petersburg - attends as a presenter.